There are two main types of skin cancer: melanoma and non-melanoma. The main non-melanoma skin cancers are basal cell carcinomas and squamous cell carcinomas. 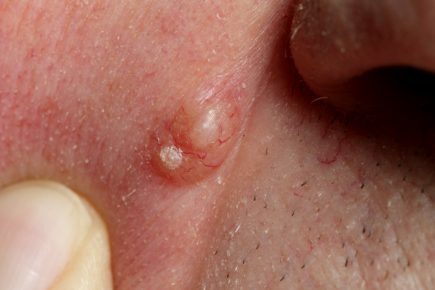 Basal cell carcinoma (BCC) is the commonest type of skin cancer in the UK. BCCs rarely metastasise. Thus, although it is a skin cancer, it almost never poses a threat to life. It is still a locally invasive growth and can cause problems. The commonest cause of BCCs is exposure to ultraviolet (UV) light from sunbeds or the sun itself. For this reason, they often occur on the parts of the skin that are often exposed to sunlight (head, face, ears and neck). People who get sunburnt easily and have fair skin are most at risk of getting BCCs. Too much UV light exposure can change the DNA of keratinocytes (skin cells) which can lead to BCC. Occasionally the diagnosis is clear from the appearance of the lesion. A skin biopsy (sample) under local anaesthetic can confirm a diagnosis. A squamous cell carcinoma (SCC) is a type of non-melanoma skin cancer. It is the second most common type of skin cancer in the UK. SCCs can invade local tissues and may sometimes metastasise. SCCs can be life-threatening. Most SCCs arise as a result of too much ultraviolet (UV) light exposure which causes changes in the DNA of the keratinocytes (skin cells). A type of human papilloma virus (HPV) is also thought to play a role. 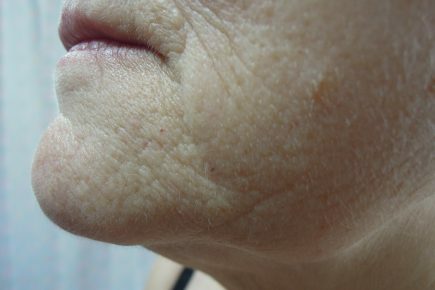 Diagnosis of a SCC is usually made by a dermatologist. The appearance and story behind the lesion give clues that point towards a SCC. A biopsy (sample) or excision (complete removal) under local anaesthetic can confirm the diagnosis; a histopathologist will closely examine the tissue under a microscope. There may also be further investigations to determine whether the SCC has metastasised. These include imaging (such as CT and MRI scans) and lymph node (gland) biopsies. Treatment differs on a case-by-case basis. If the SCC is just local, surgery is usually the best treatment option. This will involve removing the SCC with some normal skin around it to reduce the chances of any cancer being left behind. Radiotherapy (firing X-rays at the lesion) is an alternative to surgery. If the SCC has spread beyond the initial site, a combination of treatments is often required; surgery, radiotherapy and chemotherapy may all be required to treat the SCC in this scenario. Melanoma is a potentially life-threatening type of skin cancer that arises from the uncontrolled growth of melanocytes (skin pigment cells). It is more likely than other types of skin cancer to metastasise. Too much ultraviolet (UV) light from the sun or sunbeds is the biggest cause of melanoma. DNA in the melanocytes is damaged by the UV rays which means the cells can no longer regulate themselves. Genetics may also predispose people to getting a melanoma. Stage 1 is the earliest type of melanoma. 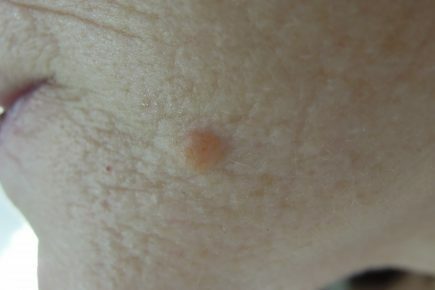 This is a thin melanoma located in the skin only. Stage 2 implies the melanoma is thicker than in stage 1 but still localised to the skin. Stage 3 is when the melanoma has metastasised to local lymph nodes (glands). Stage 4 is the most advanced type of melanoma. The cancer has metastasised beyond the local lymph nodes. 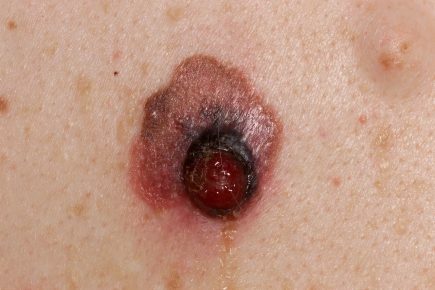 Melanoma may be suspected because of the features of the lesion such as its appearance or a history of change in an existing mole. A dermatologist uses an instrument named a dermatoscope to look more closely at the suspicious area of the skin. The best way of diagnosing a melanoma is to completely excise (surgically remove) it, as well as a small surrounding margin of normal skin tissue. A histopathologist will then carefully study the specimen under a microscope and confirm and characterise the melanoma. If the melanoma is more advanced, imaging (such as CT and MRI scans) and lymph node biopsies (samples) may be needed to investigate whether the cancer has metastasised. Following the diagnostic excision, a second surgical procedure named a wide local excision is recommended. This involves removing a larger margin of tissue (typically 1cm-2cm extra) from around the former melanoma site. This will reduce the chances of any cancer cells being left behind which could cause recurrence or even spread of the melanoma. Depending on the microscopic thickness of melanoma, a procedure named sentinel lymph node biopsy may be discussed. Opinions are divided about this investigation which is only offered in some centres. It is a tool in determining how a melanoma is likely to behave (risk of recurrence) after it has been treated but does not make any difference in the survival rate. In more advanced melanoma, radio- and chemotherapy may be amongst the supplementary therapies needed to treat cancer metastases. Targeted genetic therapies and immunotherapy are also powerful tools in combating advanced melanoma. In addition, dermatology centres often run clinical trials which test new types of treatment. Many recent advances in treatment are promising.